If you’ve ever wondered how superheroes would fare against the zombie menace, Marvel Zombies holds the answer, and the answer is: not too well. See, Earth’s superpowered, pajamas-clad best are no more immune to the zombie bug than anyone else. That means once the first heroes get turned, it’s all down hill for humanity. The story is set on one of the many, many alternate universes within the Marvel multiverse and it follows the zombie plague from its beginnings as an evil supervillain plot through the ultimate destruction of just about everything in one of the most epic zombie apocalypses ever. It’s a convoluted, fairly dense story that unfolds over the course of lots and lots of comics, which have been bundled in a series of collections. There’s a couple of miniseries, a bunch of Marvel tie-ins, some limited one-offs and even a crossover with Army of Darkness. When I heard of the series, my first thought was it was ridiculous, utter trash designed solely to cash in on the zombie craze. But after a friend loaned me pretty much everything up through the second miniseries, I had to revise my unfounded opinion. 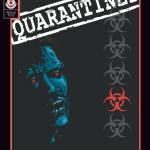 The authors do a good job, especially through the first miniseries and its tie-ins, of following through on the premise of superpowered zombies. See, the zombies retain most of their superpowers, losing only any healing abilities they might have (they are dead, after all). So as dangerous as a regular zombie is, these walking/flying/laser-beam-shooting dead are infinitely more dangerous. As you might imagine, it takes them almost no time to devour every normal human and most of the “special” humans on Earth, leaving them to seek sustenance elsewhere. I can’t reveal much more without going into major spoilers but it gets really wild in no time at all. The enjoyment to be had from these books is predicated on the level of interest and/or knowledge you have in both individual subject matters. 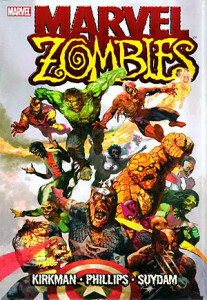 If you aren’t at least moderately interested in superhero comics and zombies, this isn’t going to do much for you. If the interest is there, no deep knowledge of comics is required. The story wisely features a cast of “heroes” that will be familiar to just about everyone: Spider-Man, Wolverine, Iron Man, the Fantastic Four and other heavyweights of the Marvel continuum. There are plenty of obscure characters for the hard-core fans, too, but if you’ve seen a summer blockbuster in the last decade, you should be able to “get” who most of these characters are well enough to follow everything. If the interest level is there, it’s an entertaining, fun and slightly campy mash up, at least through the first series. Sure, the story is spread over enough different comics, tie-ins and special issues it gets a little hard to keep track of everything (though the collections may solve that issue), but it’s largely worth it. There are lots of gruesome ends met,Â epic battles fought and clever plot twists revealed. By the end of the second miniseries, it’s devolved into a pretty standard superhero comic with zombies becoming just a minor element. It’s all supervillain this, secret plot that, so-and-so isn’t really dead, and so on and so on:Â in short, all the stuff that killed my appetite for superhero shenanigans years ago. The should have quit while they were ahead; I certainly have no interest in reading further despite really enjoying the initial story.